Ten thousand miles. A tiny car. And a burqa! 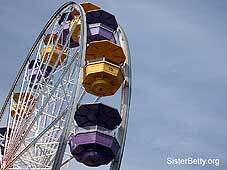 Sister Betty is currently on another giant adventure! 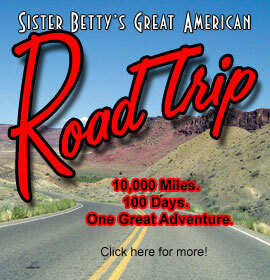 This year it's the biggest, longest, most fun road trip ever - Sister Betty's Great American Road Trip 2008! Click here to follow along and check out videos, photos and reports from the road! Join in on the fun - help plan the route and you can win $50 for suggesting a place to stay or visit. You can even win an iPod Nano just for joining the Road Trip email list. Click here for the contest details and links to enter.